EB-5 regional centers are no longer just a “pilot program”: EB-5 immigration includes both direct investment and investment through “regional centers” approved by USCIS to pool investors’ money. Even though regional centers were introduced in 1992 legislation, they remain a “pilot program” that need to be renewed through new legislation once every couple years. BSEOIMA would make them permanent. (Section 2319). Spouses and children no longer count toward the 10,000 annual cap on EB-5 visas: Currently about 2/3 of the annual cap are used by spouses and children. The bill would reclassify these relatives as “immediate relatives” (Section 2305) instead of EB-5 visa applicants. This essentially triples the number of EB-5 visas that can be granted each year. Elimination of per-country quotas: Recently, as the 10,000 annual cap on EB-5 visas has gotten closer to being used up, the State Department has warned that the 7% per-country quota may kick in for China. The way the per-country quota works is that no more than 7% of the 10,000 visas may be given to nationals of any one country so long as visas are being applied for by nationals of other countries that haven’t reached their quota. 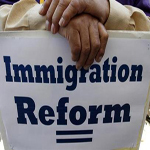 BSEOIMA would eliminate the per-country quotas for employment-based immigrants. (Section 2306).